Prominent & Leading Manufacturer from Ahmedabad, we offer foundry pneumatic sand transporter. 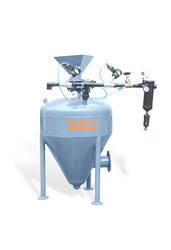 BAJRANG ENGINEERING PNEUMATIC TRANSPORTERS are dense-phase pneumatic conveying systems which, by virtue of their unique design, can transport sand or other bulk free flowing materials in a dense mass at low velocity without the add of boosters. SYSTEM CONTROL: Pneumatic Thrust conveying is a discontinuous transport process from a closed vessel. Compressed air thrusts the bulk material out of the pressure vessel through a transport pipe. In this conveying process, the cross section of the pipe immediately following the pressure vessel is completely filled. Depending on the setting and the properties of the product, plugs form, and the distance between these plugs increases. There is no dispersed conveyance. The pneumatic conveyor is especially suitable for conveying dry, granular and free - following substances. The pneumatic conveyor is never fully emptied, so that each conveying process takes place against the full line. This reduces pipe wear and material abrasion considerably. They are compact in design, require little maintenance and make little noise. Uses air pressure to move sand or granular materials through pipes. Free standing unit makes installation, inspection and maintenance simple. Transports reclaimed sand, new dried sand, Chemical Powder & many other granular to multiple points. Less wear on fittings with special design wear resistance bends. Production Capacity: 500Kg - 25,000 Kg./Hr.